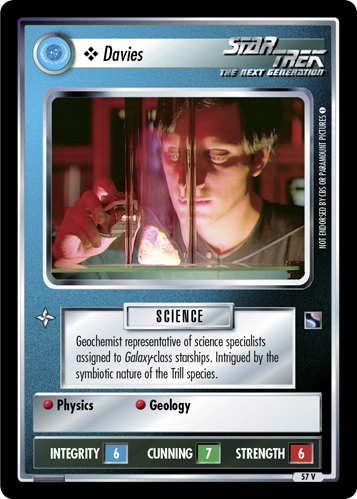 Geochemist representative of science specialists assigned to Galaxy-class starships. Intrigued by the symbiotic nature of the Trill species. Characteristics: "Continuing Mission"-related cards, affiliation, Human species, support personnel. If you play OTF this card replaces the backward compatible 2E card Davies from Second Edition - ST1E compatible (the 2E card is no longer valide in OTF). Card logging info: First edited by Telak at Jul 10th, 2012. Please support openCards and validate game text of this card!